(15/P57) TRENTON – As part of its efforts to introduce freshwater fishing to families and novices across the state, the Christie Administration is holding Free Fishing Days this Saturday, June 13 and Saturday, Oct. 17. On these two special days, anglers can enjoy some of the finest freshwater fishing in the Northeast without having to buy a license or a trout stamp. Free Fishing Days are designed to get families hooked on a new, exciting activity, while also giving out-of-state visitors a chance to sample New Jersey’s waters for fishing. Having a free fishing day in October will give anglers a chance to catch holdover spring trout and take advantage of fresh trout stocking for the fall. Free fishing on June 13 complements National Fishing and Boating Week, which also occurs each June. Although no license or trout stamp is needed, other regulations, including size and daily catch limits, will remain in effect that day, and for the free fishing day in October. New Jersey has hundreds of local ponds and thousands of miles of streams and rivers that offer excellent opportunities for a great day of family fishing. Nearly every local pond provides plenty of action for bass and sunfish. For an added bonus, channel catfish, reaching several pounds in size, are stocked in many small ponds throughout the state. Trout stocked this past spring are also still available in a number of waters statewide, and opportunities abound to catch wild trout. In addition, the Division of Fish and Wildlife offers trophy angling experiences by stocking muskellunge, northern pike, walleye and striped bass hybrids in New Jersey’s larger lakes. 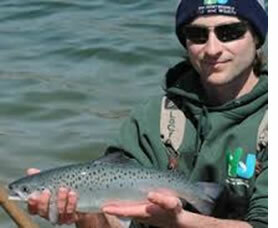 The Division operates fish culture facilities at the Pequest Trout Hatchery and the Hackettstown State Fish Hatchery. For those with mobile devices, the free Pocket Ranger® New Jersey Fish and Wildlife app provides on-the-spot information on the state’s fish species and how and where to fish for them.